Smile for the Camera 19th edition: "Gift"
I will be the first to admit that in our long, dark New England winters, I am prone to get into my pj's, slippers and bathrobe as soon as supper is over and the dishwasher is chugging away. Honestly, when it gets dark here starting at 3:15, I am ready for bed. I would be a good candidate for hibernation. Wake me when it is springtime. As a young child, I received a gift of new pjs or a bathrobe to be worn Christmas Eve and Christmas morning. This is a photo of my favorite bathrobe which I am wearing just to have my photo taken. 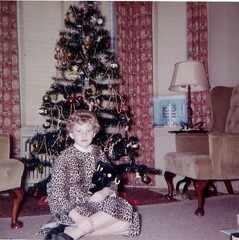 It is Christmas 1960 and I am in the 8th grade and yes, I still love my stuffed animals. I continued this tradition of buying new pjs for my daughter until recently and I think that next year, Anthony will be getting new Pjs for Christmas from me, his Grammie. Of course, that means I will need to buy new ones for me too. Maybe I can get ones that match his? Don't laugh. Excuse me now while, I go put on my bathrobe. Oh, it is only 12:50 PM. Darn. Practical gifts with a tradition and a story. A Dad has to SMILE at that every time! We got pajamas every year from the same aunt and uncle. You made me smile.